How much food waste do pubs produce and how should operators curb their leftovers? Waste reduction: the sector produces a lot of waste so how can we combat it? The fact that ‘single-use’ pipped ‘vegan’, ‘backstop’, ‘me-too’, and ‘VAR’ – as well as 4.5bn other words – to the title of Collins English Dictionary’s word of the year for 2018 demonstrates just how seriously the British public have come to take environmental issues. However, while the Attenborough effect is in full swing, the pub industry still has a long way to go in tackling the issue of food waste. According to research carried out by Waste & Resources Action Programme (WRAP), wasted food costs the pub sector £357m each year – roughly 41p per meal. Additionally, findings highlighted by the CEO of the Sustainable Restaurants Association (SRA) Andrew Stephen, reveal that this equates to 173,000 tonnes of wasted pub food every year. “If that’s hard to picture, think of a giant fleet of 13,675 double decker buses – that’s over 5,000 more than operate in London,” says Stephen. “It’s costing operators more than £350m and the planet a whole lot more – as food waste emits the same quantity of CO2 as more than 600,000 cars. “Break it down and it equates to about £20,000 per site and the equivalent of one in every six meals. Stephen, who has predicted that citrus fruit in drinks, condiment sachets and napkins could be the next hospitality staples to receive the plastic straw treatment in 2019, adds: “The findings from the SRA’s FoodSave programme revealed that potatoes, bread and salad are the most wasted items. Going green has not only proved popular with regulars at the Magdalen Arms in Oxford, but has helped operator Florence Fowler halve bin bills by reducing waste. The introduction of recyclable doggy bags has meant that a third of customers now take their leftovers home with them, while spare bones are given to dog owners. Fowler has also introduced compostable straws and co­ffee cups while polystyrene fish boxes are washed and returned to the fishmongers. Moreover, wooden or plastic vegetable crates are left in the pub’s car park with passers by urged to help themselves. Martin Venus, head of sales for the United Kingdom and Ireland at catering solutions provider Imperial Machine Company (IMC), highlights that food waste management is at its most e­ffective when the management and kitchen operators have the same end goal. “The reality is that whatever type of food business you are operating, you will be creating food waste,” Venus says. According to Venus, the best way to manage food waste is to treat it at source. “Along with grease traps, dewatering units not only assist with the removal of food waste but they also facilitate FOG ( fats, oil, grease) removal from the waste stream, preventing this from becoming an issue further down the system. “As well as removing food waste from the pipelines de-watering causes FOG to bind to the food during the process and, depending upon which disposal process is used, such as composting and/or anaerobic digestion, this FOG laden recovered food waste can be a very valuable resource. “Furthermore, implementing a waste management system that incorporates a de-watering system not only recovers the waste from the pipeline, avoiding potentially costly blockages, it also reduces the volume of kerbside collection by up to 80% with an average payback in under two years. “When it comes to the food itself, portion control offers one of the largest savings – it’s no coincidence that ‘all you can eat’ venues stand to gain the most from food waste solutions. Sarah Munday, head of new product development at condiment producer Mizkan, highlights that according to a recent report from Friends of the Earth Europe and Zero Waste Europe, roughly a quarter of food wasted in the UK is thrown away while still wrapped in its plastic packaging. “This is largely down to the fact that plastic packaging encourages consumers to purchase more food than they need to – leading to food waste. Food that is available to be purchased alone, is less likely to be wasted. “Grab-and-go operators should look at selling food unpackaged where that is possible, not only reducing the amount of packaging required, but also the amount of food that is ultimately wasted. “Instead of using cling film to wrap foods, operators should look to use biodegradable greaseproof papers to package food instead. Regular customers should also be encouraged to bring in their own Tupperware or similar to eat from and store food in, to help reduce waste. “In addition, for those inevitable times where food is left behind, operators should look to donate the leftover food to charity – cutting back waste and helping a good cause. “It is important to remember that sustainability and environmental friendliness are not changes that will happen overnight, so operators need to be realistic about the time-frames they set themselves. According to Oakman Inns CEO Peter Borg-Neal​: “If there is one over-arching principle, it is to believe that the concept of sustainability is truly important and worthwhile. “Believe in it, not just because it will please customers, and motivate staff – but because you will be making a small contribution to your immediate community and the wider global population. 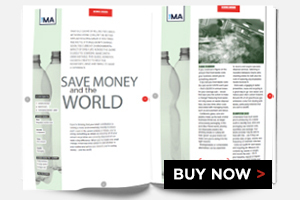 Martin Venus, head of sales for UK & Ireland at IMC​, suggests: “Firstly, prevent unnecessary waste by not over purchasing. “Secondly, review which areas of the kitchen are creating the waste in the first place and when. The Sustainable Restaurant Association CEO Andrew Stephen​ adds: “If it ain’t measured it won’t be monitored. So, the first step on the road to food waste reduction is to conduct a DIY food audit. “Effective line cleaning is one simple way for landlords to reduce beer waste and increase yield, week after week. Jeff Singer, commercial Manager for Beer Piper​, adds:“Our own data shows that the average pub landlord can throw away 16 pints per week by cleaning their lines manually, but by installing our systems they can sell up to 95 per cent of the beer that used to be lost. This equates to any average saving of £56 a week, which is almost £3,000 a year. “Beer Piper’s systems make cleaning beer lines much less time consuming, less costly and less impactful upon operations, giving pub operators and owners real time data on their dispense systems. “Additionally, well cleaned lines make for a better pint all round, which can lead to increased sales and happy punters. Brigid Simmonds, chief executive of the British Beer and Pub Association​ (BBPA), commented: “BBPA has taken action to support its members to reduce waste in their pubs, from working with the sector to eliminate the use of single-use plastics through ’The Last Straw’ campaign, to supporting WRAP’s Food Waste Reduction Roadmap. “Our members have gone even further, from recycling 100% of their waste in pubs, to sending their food waste for anaerobic digestion, turning their food waste into biogas”. A BBPA spokesperson added that pubs can make small, simple changes to help to protect the environment, whilst also saving themselves money. From the elimination of plastic straws and stirrers which reduces the need for single-use plastics, to following WRAP’s Target, Measure, Act principles to identify and reduce food waste in kitchens.